I have spent more time at Oakland Coliseum in recent years for work than for play. In 2009, I shot the Raiders’ season opener against the San Diego Chargers for a story in my paper and a few weeks ago, on October 10, I partially met a professional goal of mine by helping out the Associated Press for a job. I asked my friend, Associated Press staffer Marcio J. Sanchez, if he needed any help in the MLB postseason as both the A’s and Giants had made it and he told me I could assist in Oakland, depending on how they did early on in the series. The afternoon of game 4, I met Marcio in Santa Clara and we drove to the stadium with a small bag of my Nikon D700, and a 35mm and 85mm lens. We bypassed all the normal routes in the stadium through dank tunnels and paint-chipped stairwells and ended up in the AP photo room, complete with the ancient film development station that currently housed some weird mold. Then we wandered around the field and the parking lot before the game looking for feature shots and met fans partying in the parking lot. Marcio was gracious in answering all of my many questions about photos he is looking for and what works for a good feature. I snapped along as we walked, producing a personal small gallery of images. 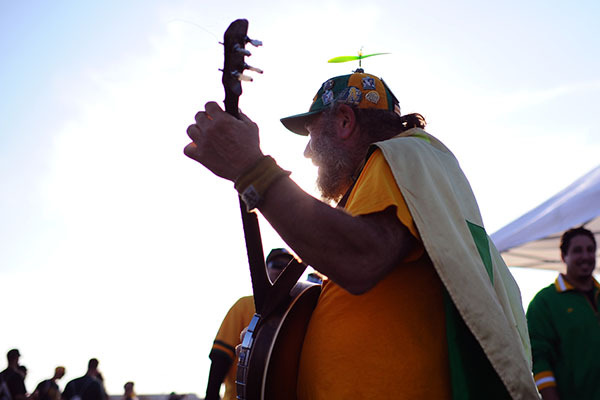 As Marcio dropped his photos off to the editor, he was chastised for not getting the name of a fan—who we later Googled as “Banjo Man”—and I laughed, as my editor at the Weekly gets on my case for not getting names in photos. I was sort of glad to see people above me that I respect in the field get in trouble for similar things. During the game, my job was to run cards for Marcio’s position in the third base photo well and change out the cards in the home plate remote, but got to shoot from the AP spot near home plate if I had time. I got a good workout as a hustled up to the windowless AP room and back to the shooting spots, but got the job done, save for my super sore legs the next day. As I explain to people, even though I’m not a huge sports fan, shooting ANY athlete at the top of their game is exciting as it’s just, pure good athleticism and as I watched the A’s force a game seven to the now-American League champion Detroit Tigers, I got the baseball fever that attacks so many during the year. I was sitting near Marcio at third base as the A’s rallied in the bottom of the ninth, Coco Crisp knocked a single to right field to win. It was nuts as fans screamed in every direction and Oakland’s dugout cleared onto the field in huge jubilation. It was unreal and really loud. As a photographer in California, I wanted to meet many of the photographers in the Bay Area who I admired for their professionalism and superb pictures and have offered so much of their insight to us younger shooters on Sports Shooter. One of these guys was Brad Mangin, who was super nice and just has an obvious passionate love for baseball. He is like a little kid attending a major league game for the first time. The entire AP staff alongside Marcio, with editor Stephanie Mullen, photogs Ben Margot and Eric Risberg, were great and cordial and joked around a lot. What was especially cool was to see how a full team of photographers approached a major sporting event and how nine innings of photographs made their way to Stephanie who edited it down to around the top 50 images that goes out on the wire. It was a neat way to understand the full process of getting only the best of the best images that get published. I hope to help out the AP again soon. Nic Coury is a staff photographer with the Monterey County Weekly and a frequent contributor to the Sports Shooter Newsletter. Check out his work at his SportsShooter.com member page: http://www.sportsshooter.com/members.html?id=7571.